There's something about my mood as of late which has been inspiring me to wear lighter colors. Of course I still must wear some darks, like my tights, but overall I have been so bright! We'll see how long this lasts. For now I'm just enjoying the colors. what a lovely dress! the lace detailing and colour are wonderful! These pictures are so cute, especially that big old smile in the 2nd to last. :) I adore the dress and the necklaces. Great outfit! Very cute outfit! I can't wait for the spring!! The necklaces are awesome tooo! Again, I can't get enough of how you contrast your outfits! I love it! 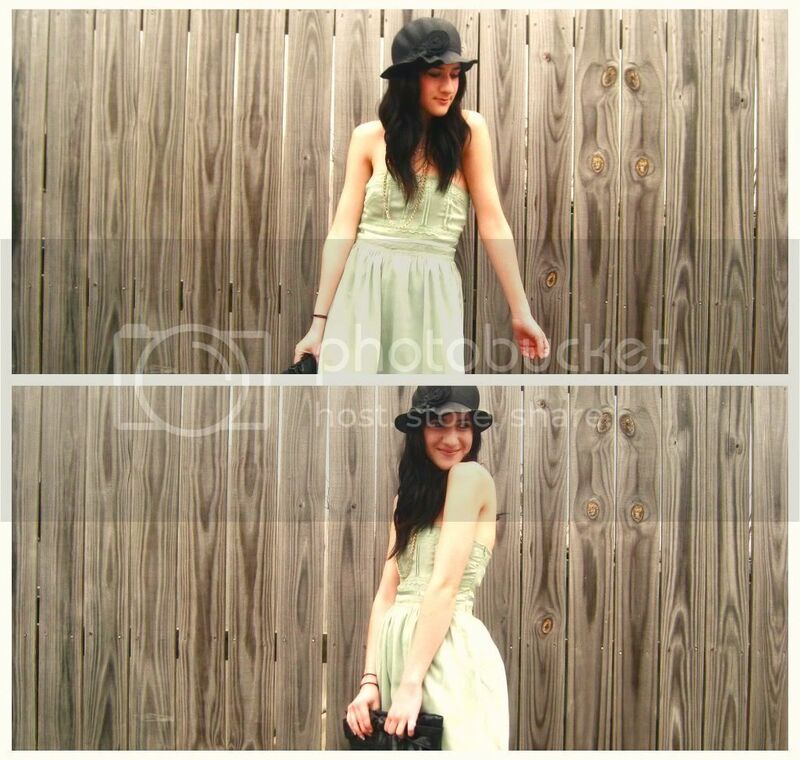 thats such a cute dress.. i'm jealous that you're going into the warmer months!!! I love Amelia! You and your outfits are entirely too adorable. I love the hat and the layered necklaces especially. I can't believe how warmly you're getting to dress! So totally jealous. Looking great with that lovely dress and those layers of necklaces. love the contrast!! but then, I always do. 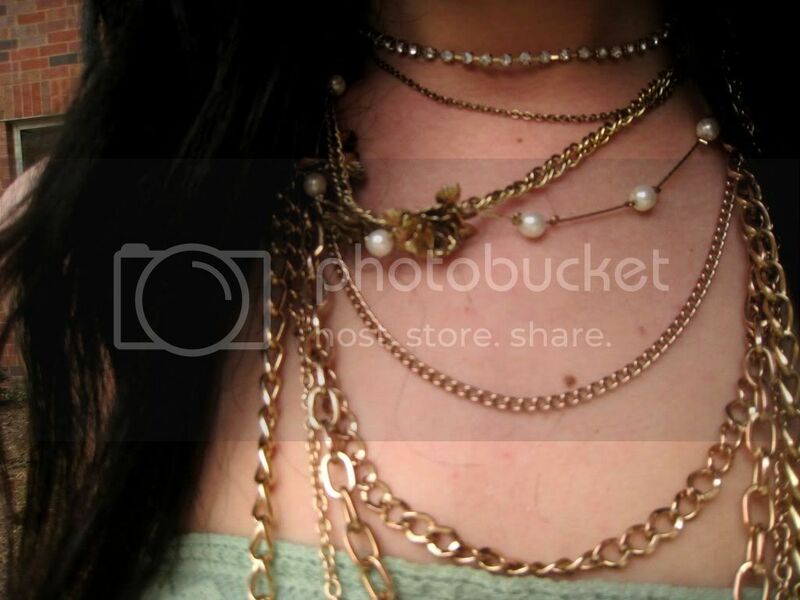 The layered necklaces are genius. Looks amazing! And Amelie is an AMAZING movie! love the outfit.. the colors are fab! i love that green! so adorable! LINK ME!? You have no idea how much that would mean to me! Link away, by all means! This outfit by the way makes me even more excited to wear open toe shoes! And the dress, would look incredible just about anything, I would pile on the jewlery and my NEW SHOES! Which you need to check out! I am featuring them in a day or too, I have a feeling you'll love it! Your outfits never fail to please darling. Beautiful dress in all respects. I am trying to get my blog going, any tips? Aside from the fact that I need to blog more haha. That dress is a very pretty shade. That dress is really sweet. And the accessories makes the outfit look even sweeter. love this outfit! one of my favs for sure. you look great and i think the hat makes it! Great outfit, ligth colors suit you very well! I love that you watch Amélie! And this outfit is so cute, love the colours and your necklaces!